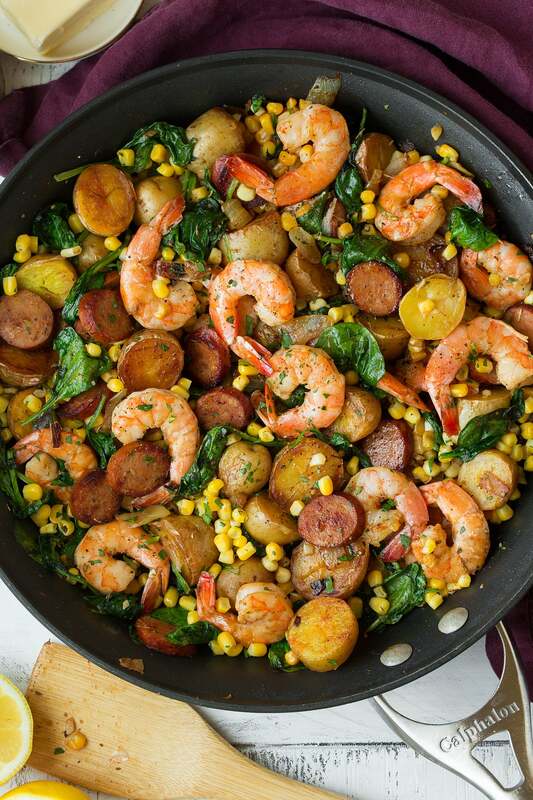 Shrimp Boil made in a skillet is an exciting twist on the classic! All the great flavors of the traditional version yet here you get even more flavor thanks to the browning you get from a skillet. It’s so easy to throw together and you’ll love that it’s ready in no time! Shrimp Boil Cooked in a Skillet! As we know the classic shrimp boils are always made in a pot, boiled in water but this version that’s made in a skillet is so much better! 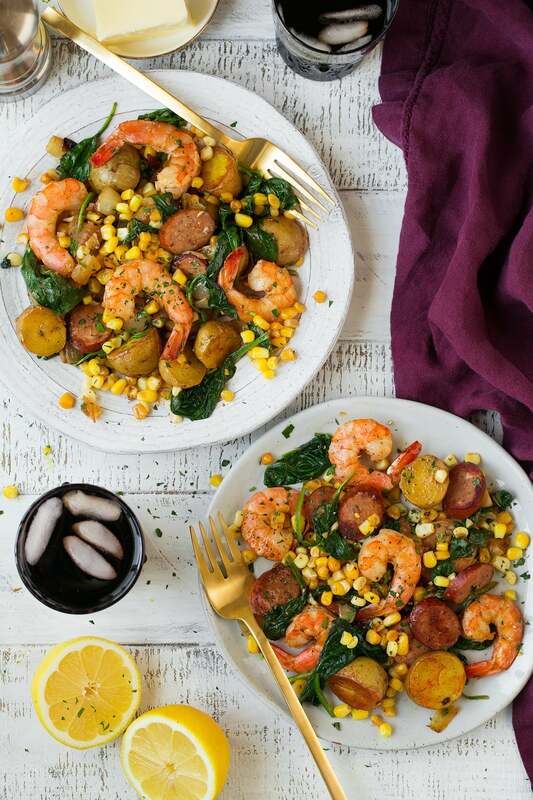 Plus you’ll love love the nutritious, colorful addition of spinach which you don’t normally get in a traditional shrimp boil. 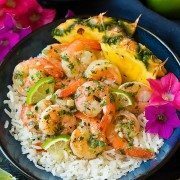 This is a perfectly hearty meal and it’s sure to please all shrimp fans! 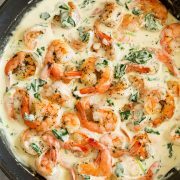 This shrimp recipe only takes about 20 minutes total cook time, plus you can save yourself time by cooking the potatoes in the microwave while the onions are cooking in the skillet. Easy to make, not much clean up, packed with goodness and perfectly delicious! This is one for the recipe book! Watch the Video (1 Min)! Par-cook potatoes in microwave. Cut into halves. Meanwhile saute onions 4 minutes. Add in potatoes and saute 3 minutes. Add sausage to other side of pan and cook, tossing occasionally until sausage is starting to brown slightly, about 3 minutes. Add in garlic and saute 1 minute. Add butter, shrimp and corn to skillet. Sprinkle in seafood seasoning and thyme and season with S&P. Cook 2 minutes. Toss in spinach and cook until spinach has wilted and until the shrimp is cooked through. Finish with lemon and parsley. Use fresh corn in the summer or frozen corn when you can’t get fresh in the winter. Stick with turkey or chicken sausage for a healthier option than beef/pork. 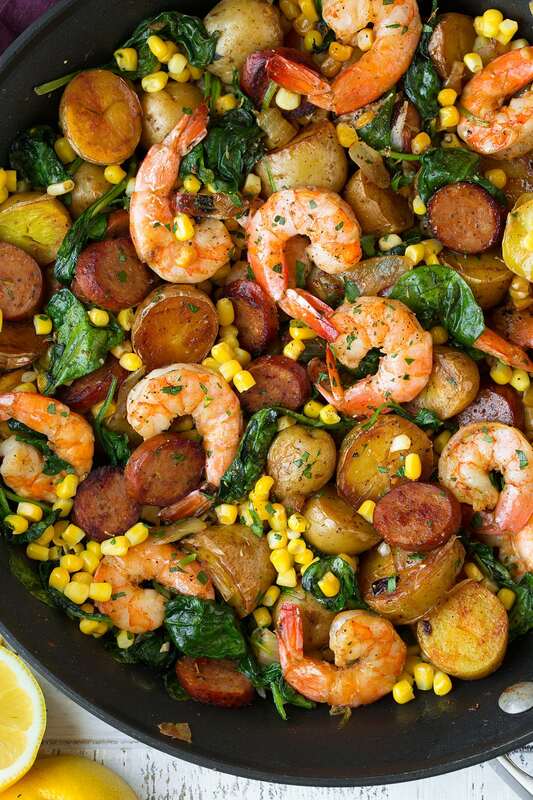 Skip the spinach if it’s just not your thing in shrimp boil. If you don’t like heat use a milder seafood seasoning and mild sausage. Use frozen shrimp (then thawed shrimp) instead of the thawed kind from the meat counter. Or of course if you can get fresh caught that would be amazing. Let ingredients brown a bit so you get more flavor! Don’t stir too much. 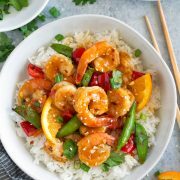 More Shrimp Recipes You Need to Try! 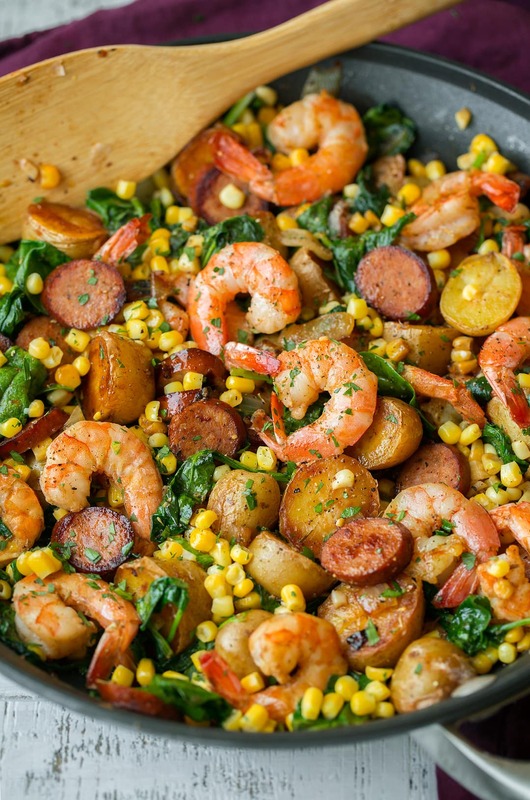 Shrimp Boil made in a skillet is an exciting twist on the classic! All the great flavors of a shrimp boil yet it this version has even more flavor thanks to the browning you get from a skillet. It's so easy to throw together and you'll love that it's ready in no time! Place potatoes on a large plate and microwave on high power for 2 minutes. Turn potatoes then continue to microwave until just tender, about 2 minutes longer (if they aren't really small they'll take a little longer. Make sure they are tender at this point). Let cool slightly then cut in half. Meanwhile, heat olive oil in a very large non-stick skillet (at least 12-inches and deep) over medium heat. Season with salt and pepper and cook turning occasionally, until lightly golden brown, about 3 minutes. Push potatoes to opposite side with onions. Add sausage to other side of pan and cook, tossing occasionally until sausage is starting to brown slightly, about 3 minutes. Scoot sausage add in garlic and saute 1 minute, or until lightly golden. Add butter, shrimp and corn to skillet. Sprinkle in seafood seasoning and thyme and season with salt and pepper to taste (don't overdue it with salt as the sausage is salty). Cook tossing occasionally 2 minutes, then add spinach and cook until spinach has wilted and until the shrimp is cooked through (it should be opaque throughout). Pour in lemon juice and toss. Serve warm garnished with parsley if desired. Frozen and thawed shrimp is recommend instead of the shrimp at the meat counter. It may have been sitting there for a few days. Weight taken after shrimp is thawed. *Note that this is spicy, if you don't like heat use another seafood seasoning and a milder sausage. **Tip: put potatoes in cut side down so they'll brown nicely. Those rounded sides don't brown as well. Also don't stir much during cooking so ingredients have a chance to brown a little. Amanda: LOVE LOVE LOVE cajun shrimp! Looks absolutely amazing–and the photos are making me even hungrier!